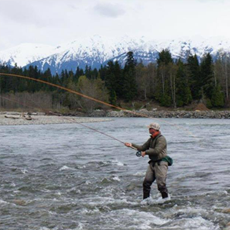 In the spring we were spot on with everything: the fish were there, the conditions were just right – the rest was up to us and our fly fishing skills. You can do a lot of preparation before you hit the water, but when you are on the water, this is the time and place to get everything just right. In my fishing, the speed of my fly and the depth at which my fly is fishing is very important. Therefore, it is crucial for my success that I can follow my line in the water as well as in the current. I can honestly say that I have tried and used a lot of premium fishing eyewear in my 27 years as a fly fisher, but I have never found a match to Wiley X in this phase of my fishing. I can follow my line in the water and read the water perfectly when wearing Wiley X polarized eyewear. 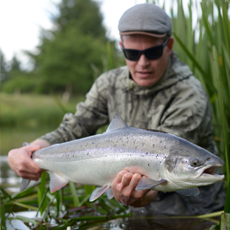 The fit of the eyewear is fantastic – often I don’t even feel I’m wearing them, which is ideal when fishing for a whole day. Wiley X has helped make me a more successful angler and right now my favorite is the new WX Omega with Polarized Emerald Mirror Amber lenses and the Kryptek® Neptune™ Frame. I am a freelance author, illustrator and artist. But between assignments, I try to squeeze in as much fishing as I can, and I love all kinds of fishing and fish for all kinds of species. This means that the trunk of my car is in constant disarray with all kinds of tackle. The one thing that never changes, though, is my eyewear. I've used Wiley X for a long time now, and I honestly can't imagine being without the confidence it gives me. 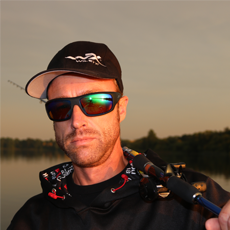 Since first joining the WX euro fishing team and now being an Ambassador for the company, it puts me in a very lucky position to try many of the different styles and lenses, that Wiley X produce. For me personally, my favorite by far is WX Valor. They are stylish with different lens and frame combinations and all the safety features we have come to expect from this top quality company. I'm Eric Torres from Spain. I enjoy many different kinds of fishing, but carp fishing is one of my favorites. I fish all around the world for different fishes, and one year ago I started doing land based Shark fishing and I love it!! I use Wiley X on all my fishing trips. It is perfect for seeing the fish under water and I feel more safety. The new WX Omega with Polarized Emerald Mirror Amber lenses and the Kryptek® Neptune™ Frame is my favorite now!! Looks very cool!! I have tried a lot of various polarized glasses, but with the WX eyewear I have found a pair of fishing glasses that got it all. Look, fit and weight are important features for sunglasses, but the most important feature is the polarized filter, and I have not found anything better than Wiley X. My favorite style now is the WX Hudson with Polarized Platinum Flash Smoke Green lenses. They are especially great in strong sun or in bright days. When autumn/winter approaches I change to WX Legend with Polarized Amber Gold Mirror lenses. My profession is to teach other people how to fish, and I spend all my spare time searching for seatrouts and salmons. 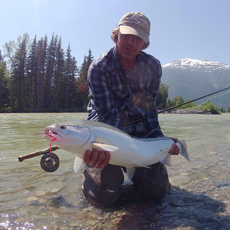 To catch a white salmon with a single-handed fly rod is the ultimate experience for me. The perfect fishing experience needs the perfect gear, - and I will never compromise with my gear. 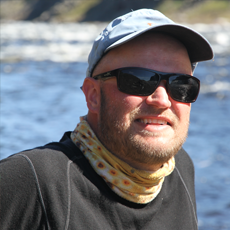 I have been wearing Wiley X glasses for more than a 1000 fishing trips home and abroad since 2010, and they have never let me down. Sublime polarized filter and an impressive strength. Now I wear WX Peak which is a pair of strong sunglasses with a fantastic fit and style and suitable for all kinds of activity. I am 39 years old. I live 25 miles outside of Rome, and I started fishing at the age of 5. 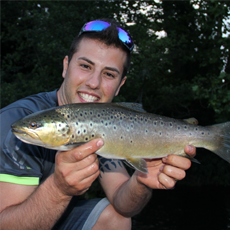 Fishing has always been my great passion, and therefore I started my fishing journalist career at the age of 22. 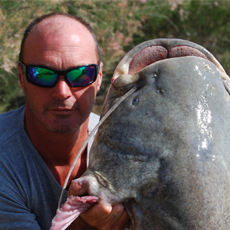 At the moment I write for many Italian and European fishing magazines, online magazines and make a lot of videos for fishing TV and YouTube Fishing channels. 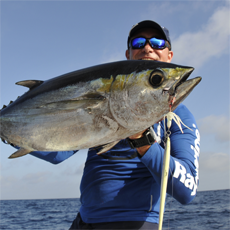 I am a salt water fishing guide and organize fishing trips around the world (Indian and Atlantic Oceans, the Caribbean Sea etc.). Generally I fish in the Mediterranean Sea with great results. I am also involved in inshore and offshore fishing. Catching predators is my biggest passion, and for this reason I love offshore trolling, bottom trolling, vertical jigging, popping and lure fishing in general. Last year I obtained good results in offshore fishing competitions. The WX Gravity is my favorite style. It has top optics and reduces all shades, and due to its polarized filter, I am very often able to see the fish in the water even when the sun reflection is very strong. I am proud to be a part of the Wiley X Family. 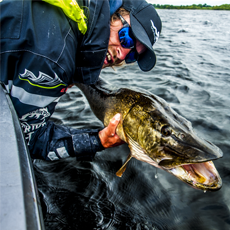 Being the owner of LakeFishing Denmark, who offers boat rental and guided fishing tours, I spend many hours on the water in all kind of weather conditions and therefore I need the best protection possible. Wiley X offers me the most optimal options for protection and safety as well as a sublime fit. The Wiley X patented gasket system reduces backlight and increases the effect of the polarized filter. The patented gasket system is ideal by high speed racing or in windy weather conditions avoiding your eyes to dry out. For me it is a must always to bring the WX Tide and WX Boss with me on long days – both eyewear with gold mirror amber lenses. I am a passionate sport fisher who has fished for predators for many years. 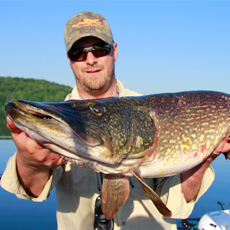 I am primarily into pike fishing with lures in lakes and in brackish water. I am also looking for walleyes on the lakes which are to be caught at vertical jigging. Creek fishing in the cold months for brackish water perches is a favorite too. 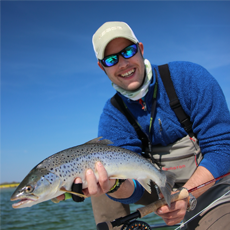 The Purefishing Denmark blog always describes and shows catch reports of my various tours. My favorite eyewear is WX Boss with amber colored lenses and a perfect fit. It gives me a great view of the life beneath the surface even in various light conditions. Furthermore this model can be fitted with the removable gasket system, which gives you the optimal benefit of the polarized filter – even with the sun in your back. I use Wiley X in my professional life as a pump-technician (WX Profile WorkSight) where safety always comes first. Fishing is my great passion and I travel all over the world fly fishing for salmon in places like Lakselv in Norway or for Giant trevally on Astove Island in the Seychelles. My favorite styles are WX Peak with Polarized Amber lens and the WX Moxy Polarized Crimson Mirror Smoke lens. I believe Wiley X provides me with the best possible chance of spotting the fish in all different light and wind conditions, as well as offering me the ultimate in eye protection. I am a professional fishing guide from Finland. I prefer to hold a fly rod in my hand but I also enjoy casting for pike, jigging for perch or vertical jigging for zander too. I like travelling around the world for fishing remote destinations like Panama or Greenland. My Wiley X eyewear of choice is the WX Omega as it covers my eyes completely and is very sturdy. And they look cool, too! Since 2006 I have been a fishing guide in Ireland. 99 % percent of my time I fish for pikes. 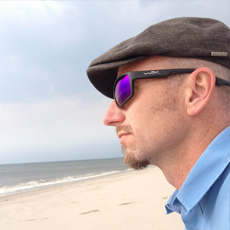 My favorite Wiley X eyewear is WX Omega with Polarized Emerald Mirror Amber lenses. I can use them in any weather condition and in Ireland we have lots of cloudy days so a clear view is crucial!! I have fly-fished in all kinds of beautiful places for wonderful fish; huge and weary brown trout in New Zealand, awesome Atlantic Salmon in Russia and Iceland, feisty Steelhead in North America, gracious grayling in the Balkans and my ‘local’ fish in Denmark– the superb sea trout in rivers and on the coast – just to name a few. 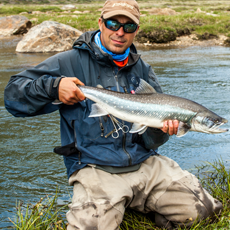 I have used my Wiley X Gravity glasses on recent trips and they do an awesome job for spotting fish and eye protection! I have several favorite WX eyewear styles, depending on where and what I am fishing for. Mostly I wear the styles from the Climate Control Series. I am not always wearing the gasket but it is a great add-on, as I fish under various conditions. I fish from India to Kenya and further on up to Faroe Islands and also the Danish coasts and waters. For me it is very important with a tight fit that follows my head shape perfectly, and all the WX styles do so due to the U-shape form. I select my eyewear and lens color according to the present daylight and the conditions I will be fishing in. I find the Climate Control Series great. On coasts with a lot of sand and wind the gasket system shows its worth. My eyes do not get irritated by strong wind and sand. I often wear a buff while fishing abroad. It ensures my eyewear not to fog while breathing through the buff as it is placed above my nose and cheekbones. 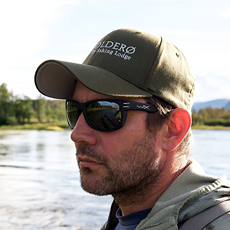 On days with a lot of reflections from the water my WX eyewear is really fantastic – it completely closes out all side- and backlight. These are just a few of the reasons why I find the WX eyewear so fantastic. 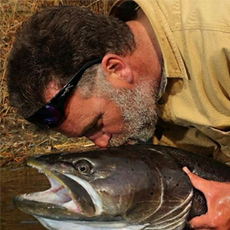 Fly fishing is my passion – especially for fat fins. On most of my excursions I fish for salmon in the streams in the Western part of Jutland or for seatrouts along the coast. I am a great fan of travelling around the world with my fly rod, and I have spent several months in Norway and Sweden. Additionally I have been to Mexico and other exotic and very fantastic fishing places. I love fishing, and I am very much into all the small technical details and aesthetic adjustments that can make my fishing even more efficient. Since 2003 I have been an instructor in the Danish Sport Fishing Federation. In various courses, I teach and guide in casting, fly tying and various fishing techniques. I love sharing and telling about all my experiences. Ever since I had my first pair of WileyX glasses, they have been the only style for me when fishing. The quality is high, the polarized filter is unmatched and gives me many advantages when fishing, and at the same time, the protection of my eyes are excellent. Another great feature about the Wiley X glasses is that they can be fitted with prescription lenses. All details have been thought through which give a fantastic product. My favorite style is WX HUDSON. It is light, elegant and has a cool classic look and it fits my face perfectly.